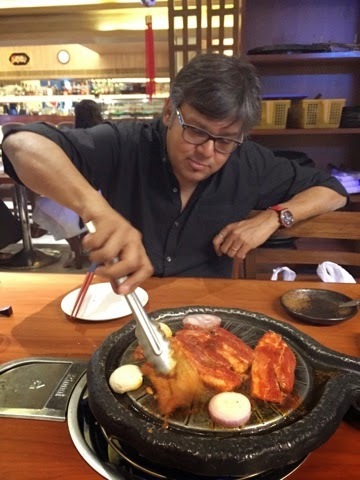 My friend, Kaniska, was in town recently and we went to Heng Bok, the new Korean place in Bandra for dinner. The good soul that he is, Kaniska was indulging me I guess on the choice of restaurant. Heng Bok was my suggestion. Kaniska now lives in Dhaka which has quite a few Korean places so I doubt if going to a Korean place would be novel for him. I think Heng Bok is Mumbai's first stand alone Korean place. My earlier interactions with Korean food were in Melbourne and Sydney and at Gung in Gurgaon. I like Asian food and wanted to try Heng Bok out. 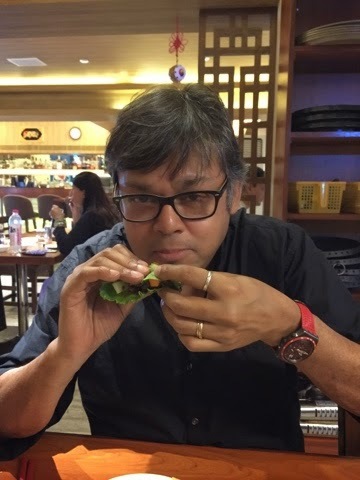 I know that I have been saying that we need more interesting Indian restaurants in Mumbai. But I want good world cuisine to be accessible locally too. Specially Asian. I guess there is no end to ones desires! Heng Bok is owned by the same guys who run, Kofuku,the Japanese place in Bandra. Hence Kofuku has the Korean bulgogi on the menu and Heng Bok has sushi. From what I understand, the Koreans didn't look upon the Japanese too favourably after the world war so what the Kofuku folks have done is the equivalent of people from a third country putting up an Indo Pak combined restaurant. Well, all for world peace I guess. The promoters and chef at Heng Bok are from North East of India and not Korea. 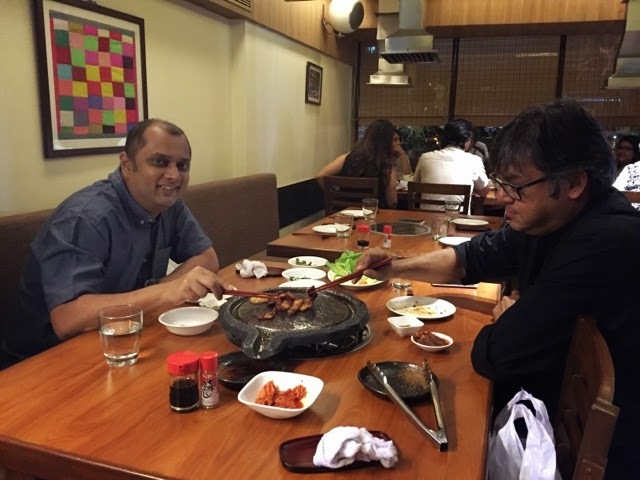 Our chatty waiter, Vikram, who had taken the pains to educate himself on the nuances of Korean food, told us that chef had trained in Bangalore and apparently spent three months in Korea. Gung, on the other hand, is run by a Korean family. 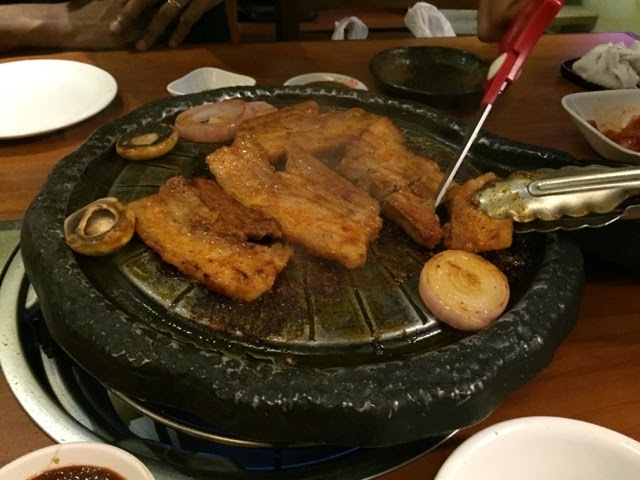 Vikram claimed that Korean guests who visit Heng Bok find the food authentic. An Indian lady at the table next to us told me that her Korean friend had recommended this place to her. We went for the pork belly. 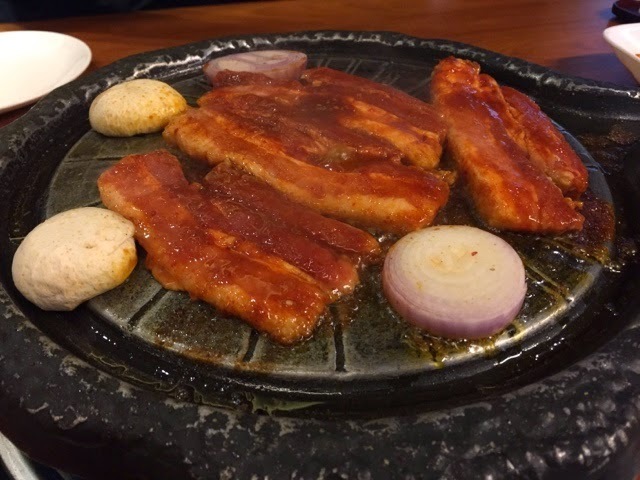 I remembered the non-spicy pork belly at Gung being rather tasteless and asked for the spicy version at Heng Bok. 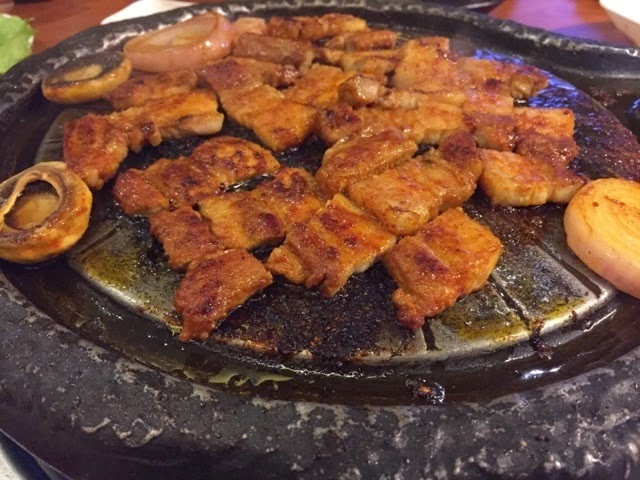 Four slices of pork were put on a grill in our table. We had to turn it around to ensure is didn't over cook. We left it for too long in one side though and it got a bit charred on one side. So remember to turn it around fast. Once done the waitress cut the pork into cubes with a scissor. 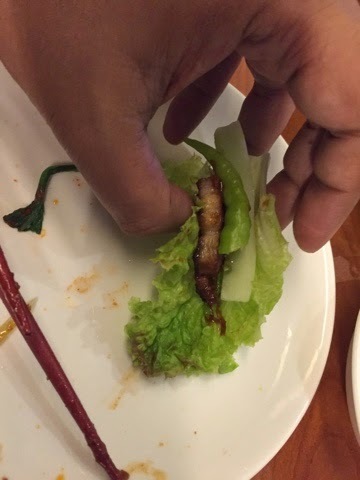 We then made a pocket with lettuce leaves, as I was taught in Gung, put the belly inside it and ate the lettuce sandwich. The 'spicy' bit added a touch of sweetness more than heat to it. The portion of belly was substantial and imported from Belgium I was told. It cost Rs 1000 a plate which is quite a bit and I don't think this is the best pork belly I've ever had in my life. It was not very juicy. Not sure if it was the worth price but for the pedigree. I remember the barbecued pork in Gung as being on the dry side too. 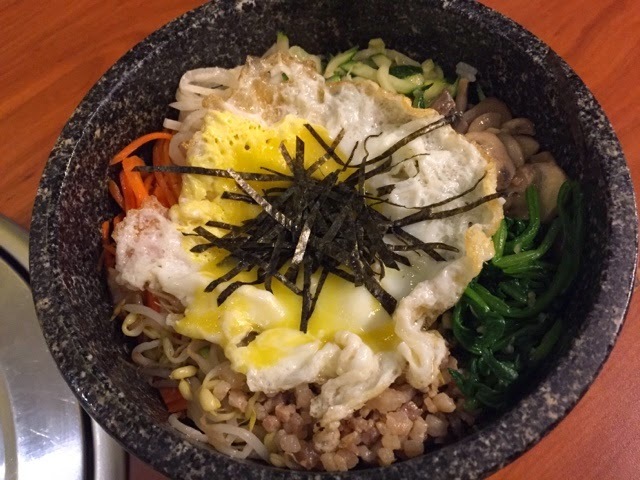 We then had a bibimbap rice which was got in a stone bowl and mixed in front of us. I found the rice a bit too moist. 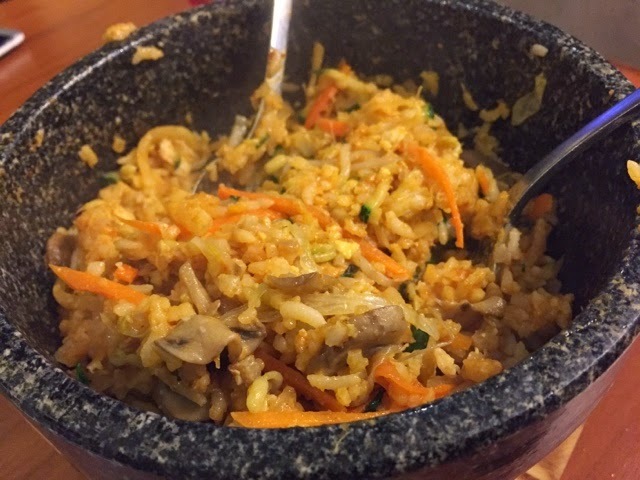 I messed the textural contrast of the kimchi fried rice in Gung in the Heng Bok bimbap rice. As a dish I preferred the fried rice. Also the rice in Goong had fatty pieces of meat. 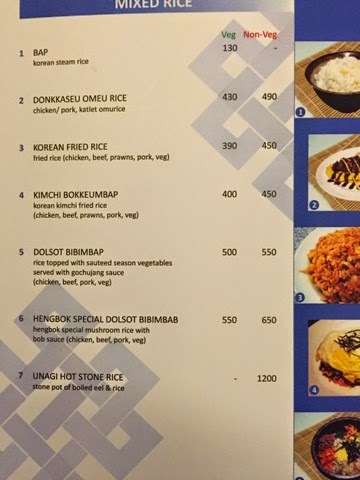 We had ordered a pork rice here and couldn't taste the pork at all. The waiter said the pork was minced very finely and hence not discernible. Neither of us took to the rice very much. The rice was about 500 so our dinner ended at less than Rs 2000. Not a cheap meal. The price is for the novelty I guess and the imported meats. They said their beef is from Australia. 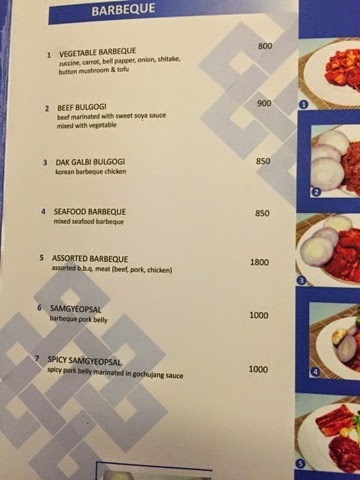 Wonder if they will still serve it after the beef ban. The ambience was cosy like in the Korean restaurants I saw in Singapore today. Not really as classy as you would expect given the fine dining prices. They don't stock the raw beef Sashimi in Heng Bok that I loved in Gung. The meal starts with kimchi here too though these are not as varied as in Gung. If you like Asian food and want to try out something new then it's worth a visit. Ask the staff to help you order. Some of them are pretty knowledgable and helpful. I have a high school classmate who works for Samsung in Mumbai. I wonder where Koreans working in companies like that go out for Korean food. keeping a homily feel to the blog ?